The latest Weekly Photo Challenge focuses on nostalgia and these photos conjure nostalgia in so many ways! My writing room. Tile floor by me. Fake fur chair by Los Angeles designer Harry Segil. Back in those days, I worked in Hollywood and supported only me, so I had money for snazzy chairs. In these photos is a tile floor I laid myself. Laying the floor took a long time, but not nearly so long as coming up with a design I liked. When I did the floor, I listened over and over to two record albums by my favorite band the Replacements: Tim, which had just come out, and Let It Be. There is still a bit of grout on the LP labels. 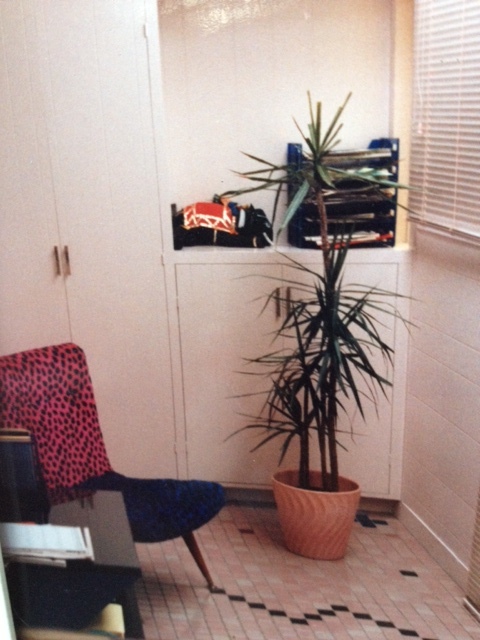 This was the room where I did my writing, and I wanted it to be special. I furnished it during the first of the mid-century revivals. I loved writing in that room. It was here that I wrote my psychological thriller about split brain research*, ?Was It A Rat I Saw?, under contract to Bantam-Doubleday-Dell. BDD gave me an advance to write ?Rat?, so for a year, my only job was writing. Bliss! I published ?Rat? then I stopped writing novels for a long time, until I resumed with Scar Jewelry, my novel about family and music, which I wrote on weekend mornings in between everything else. I had forgotten how great it is to have writing as my only work, until the last couple weeks: I am laid up convalescing after hip replacement surgery and am getting a ton of writing done. More bliss! In fact, I expect to complete a first draft of my new fantasy detective novel, Frames, before I have to return to the d-a-y j-o-b. I am writing Frames on my iPad, as I recently posted. I wrote ?Rat? on a technology of equal or surpassing greatness, the IBM Correcting Selectric typewriter. Kids, you had to be there to appreciate it. 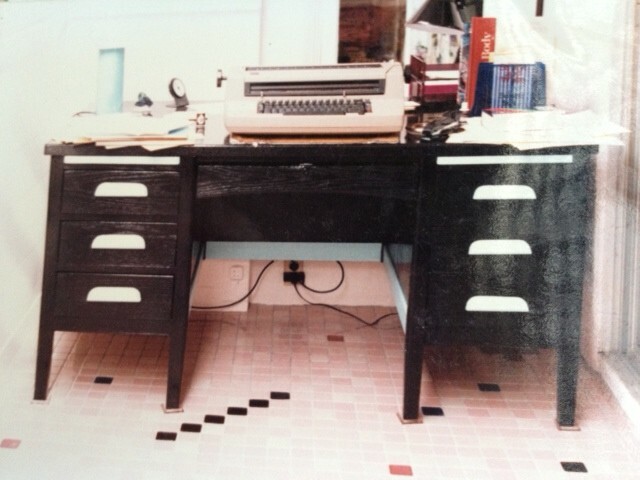 More of my tile floor, and the world’s greatest writing machine: the IBM Correcting Selectric typewriter. P.S. Contrary to what this image shows, the desk did stand plumb with the floor. I “digitized” these old prints by photographing them with my phone and that introduced the skew. *P.P.S. Another post-op project has been to convert ?Was It A Rat I Saw? to an e-book. That new edition should be available in 4-6 weeks. P.P.P.S. Harry still makes amazing furniture, worth an oogle regardless of your price range. Thinkers have always been treated disrespectfully by the cliques of power rather than honored. 1. I’m very impressed by your tile floor. Did you come up with the design yourself, or did you find it somewhere? 2. I totally get the extra question mark in the title of your book. But, I’m about 99.8% sure that it was not there on the hardcover copy I read. (I loaned it to my sissy, otherwise I could tell you for sure.) Is that something you changed? Was it always there? 1. I designed it myself. I set out the tile sheets a whole lotta times until I had a pattern I liked. 2. You are correct. The cover designer and the publisher ignored the leading “?” in the mss and didn’t want to re-do the cover to add it. Now that I am self-publishing it will return.